This page covers materials that can be used to ballast track, where to find it, how to select it, how to test it and how to apply it. Most of what I'll deal with here is loose or semi-loose ballasting because that is what I have experience with. If you get a lot of leaf litter, then you will want to use some form of secured ballast so that you can either sweep or vacuum up the litter. Loose ballast won't put up with a Shop Vac, heavy winds, moving water or burrowing animals. In any event, its the small sharp stuff that works the best. The more "dust" it has in it the better as the really fine stuff sets up after it gets wet and holds the larger stuff. It doesn't much matter what kind of rock it came from as long as you like the color. Volcanic rock makes EXCELLENT ballast as it has nothing but sharp edges and it locks into a tight mass really well. It is usually dark in color. Volcanic rock sometimes contains a lot of iron. Please be sure to test it with a magnet as described in the section on tests. Whatever you decide to get, you must TEST it before you buy. Lock Up Test. Grab a handful of the prospective material and squeeze it. If the mass of rock seems to lock up into a solid chunk under light pressure, this is your stuff. If you can still move it around under light pressure, drop it and look for better materials. Magnetic Properties Test. Take a STRONG magnet with you. Bury it in a pile of rock and pull it out. If ANY of the material adheres to the magnet, find some other kind. If you use even slightly magnetic rock, it'll jump off the track and hitch a ride on the bottoms of your locos, either on control magnets or on your motor's external magnetic field. What ever you buy, be prepared to buy a lot. Most crushed rock weighs about 80 lb per cubic foot. If you ballast deep and wide (a 6" by 6" trench full) you'll use 20 lb/ft of track. Crushed rock is usually sold by the yard, 27 cubic feet to a yard. 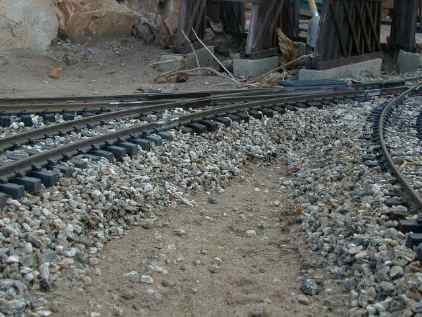 At 20 lb/ft, you'll need about a yard of rock to ballast 100 feet of track. In well drained soil, you don't need nearly as much, but it still adds up. If you trench before ballasting, you might want to consider lining the trench with weed guard. The stuff is only marginally effective in stopping weeds, but it will tend to separate the ballast from the surrounding dirt. Trenching is important if your soil drains poorly, it will allow rain to spread out and not puddle so badly around the track. If your soil is very well drained, then you can just ballast on top of the existing grade, just as the real railroads do. In this case, you will want to ballast an inch or more thick and you will have to secure the ballast by some method (see below) to prevent it from washing away from the track. Unfortunately, this is one area where the effects of the ballast do not scale. Actually, it is the rain that doesn't scale It would take a lot of rain to wash 4" chunks of rock off of a real roadbed, but it doesn't take much 1:1 scale rain to wash away 1/4" pieces. Build your ballast up to about 1" from its final height. You can use larger crushed rock for the lower layers. Then lay the track down in its final configuration and connect the sections together. Then use a large mug or cup to scoop up some ballast and pour it onto the track in small piles 18" to 24" apart. Level the track over a long section and adjust its height as necessary by working only on the little piles. When the track is at the right height and level, then pour ballast right through the track between the supporting piles. Pour on enough to cover the track. Then use an old 2" paint brush to distribute the ballast down the center of the track, allowing the excess to spill over the rails. If you have too much, brush the excess down the line to a section that needs it. If you need more, pour it on. Wiggle the track to get it to spread out and tamp the ballast. Keep checking the height and level as you go at about 6" intervals. If you are going to leave your ballast loose, just brush it out until the appearance suits you. If you are going to secure your ballast, then read the section below and make preparations BEFORE you apply the ballast. Turnouts require some special attention. There have been many methods described to keep ballast out of the turnouts. I have found that none of them work very well. Ballast gets in there anyway. I just pour the ballast over the turnouts like regular track and clean them up later with a narrow blade on my pocket knife. It is easy enough to brush out most of the ballast and then pick the rest of it out of the flange ways, points and frog. If you feel the need to "glue" down the ballast there are several methods that people have reported to work well. You don't want to make it too strong in case you need to shift things around a little. You'd like to be able to break it apart without an air hammer. Cement. Cement can be mixed with the ballast to hold it together. I've had poor results with cement mixes or mortar that has sand mixed in it. The best results have been obtained with Portland cement mixed in with the ballast. I mix approximately equal parts Portland cement and ballast and then spread the mix while dry as if it was just rock ballast using an old 2" paint brush. I then shake the track a little to settle the material. I then wet the mix down with a spray bottle until it won't take any more water. After the mix has set for a day or so, I recheck the level of the track and make fine adjustments. Then I recoat the section and wet it again to fill in any of the places where the ballast has settled during the initial shaking or wetting. If you have ballasted deeply, then use the cement/ballast mix for ONLY THE TOP LAYER. Use straight ballast for the drainage part. This will allow the set up portion to move around a little over the loose stuff below. This technique produces a fairly weak bond that will hold the ballast and track in place and still allow the track/ballast to squirm with changes in temperature. If a firmer base is required, then RapidSet Grout (brown box) or Cement All (blue box) can be used. This stuff sets up really fast and is much stronger than straight Portland cement. RapidSet is considerably more expensive than a bag of Portland cement, but it is really good stuff. Glue. I've tried various glues diluted about 50 to 80% with water and sprayed on the ballast. Most of the glues go on easily and after they are dry, leave little visual indication. Indoors, ordinary white glue works OK, but outdoors, it'll disintegrate at the first sign of moisture. Matte Medium does well indoors and stands up better to water, however it'll still soften when immersed. Yellow carpenter's glue holds up fairly well under water, but it will fall apart too. The best water based glue that I found is Titebond II. It is still affected by submersion but holds up better than the other glues. When it dries out, it'll set up again. None of these glues represents a permanent solution in a really wet environment. TiteBond II has held up well in two full years of testing, sections that haven't been stepped on are still holding fine. I've settled on Titebond II and water as my standard method to secure ballast. Gluing the ballast allows it to maintain a profile that it never could hold while loose. Titebond II is fairly expensive ($5/16 oz or $13/gal). Depending on how you mix and spray it, you can do about 4' of track on both sides with an ounce of glue. In my fairly dry environment, it holds well enough to keep the ballast from washing away in our limited rain. The glue must be diluted enough so that it can be sprayed (see below) and run down into the ballast. This caps the ballast to keep it from washing away, but it still allows the track to creep around due to thermal expansion. I have found that it is not necessary to glue the stuff between the rails at all. Only the ballast on the sides of the track needs to be glued. I don't try to keep the glue off the railheads. I just use a pole sander to clean it off after it has dried. This way, I don't disturb the track while the ballast is still wet and loose. Titebond II leaves a dirty brown cast to the ballast that seems to get darker after extended exposure to the sun. Matte medium has virtually no color at all. After I had selected TiteBond II as the adhesive, I needed to determine the proper dilution. 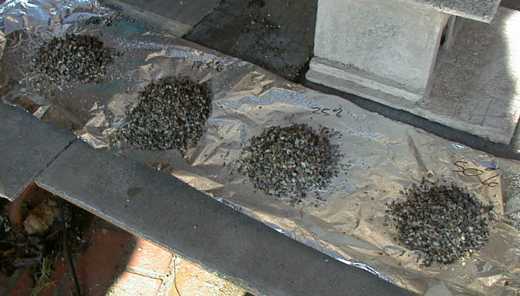 This photo shows four piles of reclaimed ballast, each soaked with a different dilution of glue. I chose dilutions of 50%, 25%, 12% and 6% glue as test cases. 2 ounces of mix was prepared for each case and about half of that quantity was sprayed on its own pile and left to set. The 50% case was pretty thick and didn't appear to soak very deep. The heavier dilutions soaked right in. Since about the same total quantity of mix was used on each pile, the total amount of glue applied to each pile was decreased by about half in each case. Heavier dilutions would be preferred as the mix will soak deeper and less glue would be needed per linear foot of track. Too heavy a dilution won't leave enough glue behind to hold the ballast in place. After the initial round of tests, a 33% dilution was added. Spray Characteristics evaluate how well the material can be dispensed from a standard pump spray bottle. This happens to be about the easiest way to apply the material. Surface Bonding evaluates how well individual particles of ballast adhere to the surface of the ballast pile. This characteristic describes how well the glue will prevent individual pieces from washing away. Adhesion Depth evaluates how deep the adhesive is effective. While 1/4" adhesion depth will keep the whole pile in place, that thin a skin is easily disturbed and can peel off leaving loose ballast exposed. 1" or more of adhesion depth provides adequate strength to allow the glued ballast to resist most normal disturbances. Clump Strength is another measure of the robustness of the glued ballast. A clump that falls apart easily will not hold up to normal environments. One that is super strong may not be desirable either as it will be more difficult to reclaim the ballast later if desired. It would appear that 1 part glue and 2 parts water is the best mix. This mix appears to be adequately strong and soaks in deepest. If you want deeper penetration, you really have to pour the stuff on. After the glue has dried on any given section of track (at least 24 hours in warm weather), I use a Shop Vac to reclaim any ballast that didn't get glued. This cleans up all the loose pieces that a subsequent rain storm would wash away and also finds the spots that need reapplication of ballast or need to be reglued. Over time, the ballast may get disturbed and peel off in chunks if the glue didn't soak deep enough. This is why a highly diluted glue mixture works well, it'll soak deeper and there is still enough glue left to do the job. When it comes time to touch up the ballast, the loose stuff and broken chunks are vacuumed up with a Shop Vac and discarded or reclaimed as appropriate. The remaining material should be resoaked and allowed to dry. This gets the glue down deeper. Then new clean ballast is applied and then sprayed with glue again. The glue will soak through this new thinner layer and bond to the old glue underneath to make a thicker stronger mass. If it becomes necessary to remove the ballast, it is fairly easy to break up the clumps and then crumble them back into individual pieces. The glue coated ballast can then be reclaimed and reused if desired.